The Prometheus X-303 spacecraft is preparing for its shakedown cruise under the command of Colonel Ronson. SG-1 has been assigned to join the mission should their expertise be needed in the event of an emergency, and an emergency does occur when the ship unexpectedly drops out of hyperspace more than 40 light years short of its target. A malfunction of the unstable naquadria-powered hyperdrive has left the ship stranded in space, light years from home. Jonas suggests risking a short burst of energy from the hyperdrive to reach an alternate destination, P3X-744, a planet which may have a buried stargate. The Prometheus reaches P3X-744 just as the naquadria reactor goes critical, and the apprehensive inhabitants permit SG-1 to land on their planet, Tagrea. There SG-1 meets Chairman Ashwan, the political leader who welcomes SG-1 as guests and long-lost brethren, and Commander Kalfas, the military leader who is deeply suspicious of their arrival. 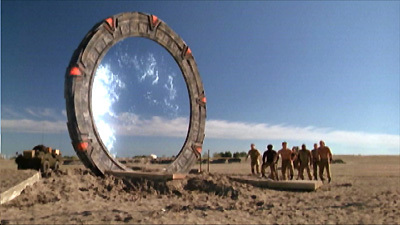 SG-1 seeks the stargate, but the Tagreans inform them that the Ring of the Gods is simply a myth. Tagrean historical records go back no more than 300 years, to a dark period when all historical evidence was destroyed in an act of defiance. The Tagreans are a race without a past. Tarek Solamon, a Tagrean professor who secretly worships the ancient gods, offers his artifacts which lead SG-1 to a vast desert where the stargate was buried long ago. However, just as the gate is uncovered, Kalfas arrives with the military and attempts to take back the ancient relic. Ashwan risks a civil war by arriving with the Prometheus to face Kalfas. He proclaims that neither the past nor the future is something to be feared, and he orders Kalfas's arrest. With Ashwan's promise of cooperation, SG-1 has found not only a way to return home and to repair their vessel, but also a valuable new ally. The Prometheus’s original mission was to P7X-009. It dropped out of hyperspace 90 minutes early, 40.62 light years short of the target. It diverted instead another .38 light years to P3X-744. Heru’ur brought the Tagrean ancestors from Earth, enslaved them, and abandoned them many years ago when the resources were depleted. The Tagreans endured a long and terrible Dark Age, and tried to destroy all evidence of their former god as an act of defiance. Historical records of Tagrea date back only 300 years. All prior history has been erased, and the “Ring of the Gods” buried. Relics speak of Horus, or Heru’ur, as the creator of all life, the one who spoke the Tagreans into existence. The ancient writings state that Heru’ur’s stargate can be found in a great desert to the north, referring to the wastelands of Anhur that lie far beyond the city. The ancient writings are a slight variation of predynastic Egyptian. Jonas is able to translate inscriptions in a slight variation of predynastic Egyptian.